A multifaceted examination of how culture is created and disseminated and notions of ownership, all packed into a tight and sprightly sixty-five minutes. Entertaining, maturely stylish, ambitious without ever overreaching. The filmmaker has made the film available for free. It’s worth your time. This is quite an honor to bestow upon our little film. Thanks to Tom and everyone else who has supported it. But every once in a while, there’s a film that packs its 65 minutes with ideas, explored fully yet obliquely– a film that makes you wish there was another half-hour to look forward to, yet leaves you feeling satisfied. One such film, peering a few decades back, was 1967’s The Firemen’s Ball, the delightful sociological comedy that is still one of Milos Forman’s best films. Another is Josh Bernhard’s The Lionshare. I do not make this comparison lightly; to my mind, the two films have more in common than the slim running time. Both films are comedies that explore sociological phenomenon with a light but occasionally biting touch; both come at their respective subjects a little sideways, making points in such an oblique and organic way that they don’t feel like points at all, that they only register on a subconscious level– which ensures that the films will last beyond the current sociological climate, that they have things to say about life when their subjects have been regaled to relics. The comparison to Milos Forman’s The Fireman’s Ball is quite humbling. Read the whole review here, and check out more of their film criticism on twitter: @tomandmary. They’re showing the movie at a Masonic Temple? Awesome. As part of a generation that has relied on IMDb to tell us, well, basically everything about movies, back in the days before it was owned by amazon.com or whatever their relationship is now, this is kind of a big deal to me. I realize it’s a little thing, but this, strangely, makes me feel like I’ve accomplished something just as much if not more than anything else that’s happened so far. HHM Fest is more than an event for those who simply appreciate film and music. It’s a grassroots effort to develop a community that participates in the arts. The festival idea developed from a “wouldn’t it be great…” conversation, into “we can do it” action. We hope our actions will inspire others to develop new arts and culture opportunities in our community. It’s our 4th year of fighting for independent film and live original music, and we have one “hell” of a line up of features, docs, shorts, animated, student and foreign language films. Plus, a Saturday night of music at the old Masonic Temple with bands Oh My God (Chicago), Baby Teeth (Chicago) and Champions of Breakfast (Detroit). Help us fight for independent film and music. Plan to attend HHM Fest-4 October 1-4, 2009. 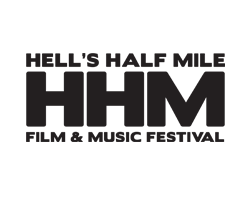 For information on advance ticket and pass sales please contact info@hhmfest.com. Sounds good to me! Doubtful we will be in attendance, but it’d be pretty cool…we’ll see what happens.